The skincare business has grown exponentially into a multi-billion industry over the past decade – as more and more consumers are becoming aware of the necessity to take care of their skin. Men and women alike are increasingly acquiring knowledge not only on the importance of skincare in general, but also on what goes into the products that they are purchasing and applying to their skin. CHUDA - Hydrating Healing Cream: Created by a neurosurgeon and world-renowned chemist, this cream is the definition of medical grade luxury – with numerous clinical studies backing its efficacy on healing and sustaining healthy skin. Chuda Hydrating Healing Cream is formulated with the utmost scientifically advanced active ingredients combined with a centuries-old secret blend of nutrient-rich botanicals and natural ingredients. This truly is one of those products you have to experience to believe – with the ability to virtually vanish fine lines around the eyes and lips in as little as 7 days of use. For best results, apply liberally morning and night wherever you are experiencing dryness or where healing is needed. For more information on this extraordinary healing cream, visit the company’s main website here. CELLECLÉ - 3D StrataSculpt Remodeling Serum: Encompassing both cutting-edge science and the purest active ingredients derived from nature, this lavish serum is packed full of high-potency botanicals, restructuring plant stem cells, and volumizing peptides that dramatically combat signs of aging while restoring youthfulness to the skin. 3D StrataSculpt Remodeling Serum is uniquely formulated using NeoDermyl® and Rubixyl® – two key ingredients responsible for significantly enhancing collagen quality and the reduction of smoke and pollution-related aging. When used twice daily prior to applying your preferred moisturizer (once in the morning and once in the evening before bed), you will notice an incredible reduction in fine lines and wrinkles within 2 weeks. To learn more about this product as well as the rest of their game-changing line, visit their website here. MARY JO CELL CANDY - Super Charged Peptide Elixir: Formulated with powerful peptides and natural botanical extracts (if you cannot tell already, I am a huge advocate for having these active ingredients present in premium skincare), this highly concentrated elixir transforms tired and environmentally-stressed skin almost instantaneously upon application. Only a few drops (lightly massaged into the face and neck) are needed to restore the skin to a luminous and naturally healthy glow. For best results, use morning and night before applying a moisturiser. To learn more about this miracle find along with the rest of this highly effective new luxury skincare line, visit the company’s main site here. DECLÉOR - Aromessence Magnolia Youthful Oil Serum: Formally known as the Aromessence Excellence Ultra-Regenerating Serum, this legendary oil serum has it all – iconic packaging, a luxuriously spa-like aroma, and an age-defying revolutionary botanical blend of essential oils to plump, firm, and revive the skin. Aromessence Magnolia Youthful Oil Serum is a great option for anyone who experiences consistently dry skin (and an even better option for mature skin). For those with a more naturally dewy complexion, consider adding 1-2 drops to an oil-free moisturiser for enhanced overall hydration. If you have not had a chance yet to try out Decléor’s renowned premium skincare line, visit their main site here. LUMITY - Anti-Aging Supplements: These clinically-proven beauty supplements are specially formulated to combat the 9 fundamental causes of aging that occur in all of us internally while revitalizing the skin from the inside out. Lumity boosts overall cellular health, increases energy levels during the day, and reduces restlessness prior to bedtime – resulting in an overall higher quality of life. After only 4 weeks of taking Lumity, I found myself experiencing greater levels of energy during the day complimented by noticeably improved sleep patterns – making these supplements a winner in my book! Backed by a 30-day money back guarantee, these little beauty pills can be tried with zero financial commitment. Check out the company’s site to learn more about how Lumity can improve your quality of life here. JANE IREDALE - Advanced Nutrition Skin Omegas Supplements: Let me start by saying this is the first dietary supplement I have ever taken that has significantly improved the appearance of my skin in a matter of days. In less than a week, I noticed my hands in particular were not as excessively dry as they normally appear (my profession constantly requires me to wash my hands – stripping them on any natural oils leading to persistently dry hands). Advanced Nutrition Skin Omegas work from within to bring hydration back into the skin. If you suffer from routinely dry skin, I highly recommend giving these a try – I am sure you will be more than pleased with the results in a matter of one week if taken as directed. These supplements will be available for purchase in August along with a full line of additional beauty vitamins. For more information on Jane Iredale and here currently available cutting-edge skincare and cosmetics line, check out the company’s website here. 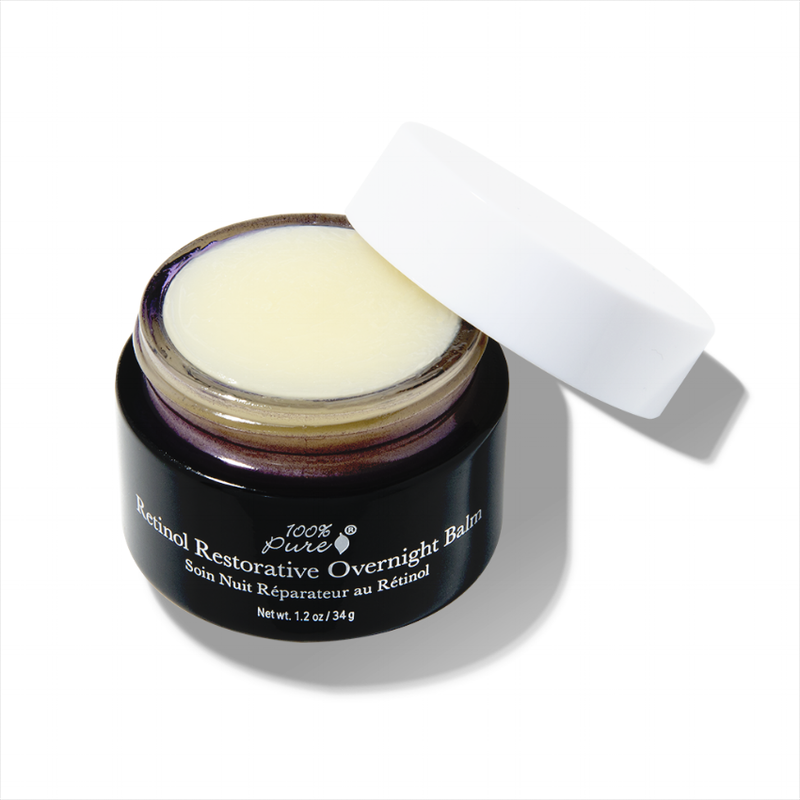 100% PURE - Retinol Restorative Night Balm: Given the remarkably positive response my skin has had after only 2 weeks of use, there really is nothing not to love about this new product. I applied this buttery smooth balm to my entire face and neck as the last step in my PM skincare routine prior to going to bed – and woke up every morning with softer skin and a brighter complexion. I am in my mind 20’s and (unfortunately) am starting to see the beginning of fine lines around the outer corners of my eyes and on my forehead. This night cream virtually has made all of them disappear! That being said, if you are just starting to see signs of ageing – this may be the perfect product for you to start routinely incorporating into your evening skincare regimen. For more information on 100% Pure’s new and positively effective Retinol Restorative Night Balm, visit their main site here. KRISTALS COSMETICS - 24K Gold Perfecting Series: I have mentioned over and over again to my readers that skincare always takes priority over makeup – as nothing will look more radiant than having naturally beautiful and healthy skin. I love this collection because it acts as the perfect base before applying makeup on my high profile and celebrity clientele (let alone everyone else)! In addition to having genuine gold blended into all 3 of these products, the 24K series is packed full of cosmeceutical hero ingredients such as Matrixyl® 3000, retinyl palminate, and pro-vitamin B5 – all active compounds clinically shown to combat signs of aging and revitalize the skin. For more information on this product as well as other specialized skincare series offered by Kristals Cosmetics, visit the company’s main website here.